An evaluation model for corporate governance in financial institutions is used to assess the corporate governance of financial institutions and their overall disclosure quality and to encourage self-initiated improvements in disclosure quality and governance structure. 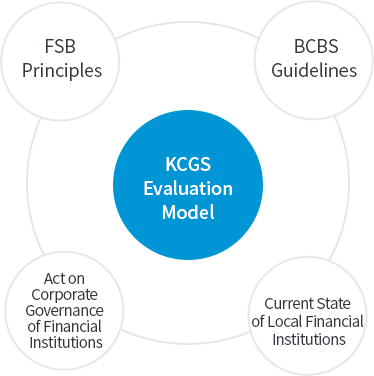 KCGS designed a corporate governance evaluation model specifically targeted at financial institutions. The model is in line with international standards including BCBS guidelines and FSB principles, and reflective of the nature of the domestic financial institutions.